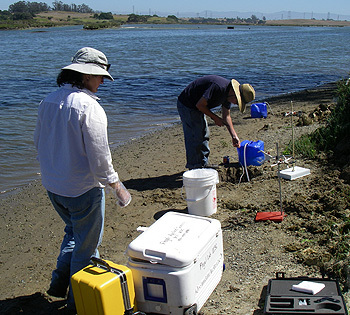 UCSC researchers monitored mercury in submarine groundwater flows at Elkhorn Slough (above) and Stinson Beach. Photo courtesy of California Sea Grant. According to the UC Santa Cruz researchers who led the project, these flows represent a significant and previously overlooked source of mercury in the nearshore marine environment. "The big question for public health is, 'Where is all the mercury in seafood coming from?'" said Russell Flegal, professor of environmental toxicology at UCSC and a coauthor of the study. "What we have shown is that methylmercury is coming from groundwater in California at surprisingly high levels." The researchers analyzed mercury in submarine groundwater flows at Stinson Beach in Marin County and Elkhorn Slough in Monterey County and reported their findings in an article published online in Environmental Science and Technology. They found that the amount of mercury injected into coastal waters from groundwater is about the same as the contribution from airborne mercury falling out of the sky (a process called atmospheric deposition). More importantly, the groundwater appears to contain relatively high levels of methylmercury, the highly toxic form of mercury that accumulates in the marine food chain and poses a public health problem in most regions of the world, according to the Madison Conference Declaration on Mercury Pollution. The study was funded by California Sea Grant, a program of the National Oceanic and Atmospheric Administration (NOAA). Previous studies have documented the presence of methylmercury in terrestrial groundwater. Fewer studies, though, have observed methylmercury in coastal waters. "What makes this study interesting is the idea that methylmercury is forming in coastal groundwater," said Cynthia Gilmour, a microbial ecologist and senior scientist at the Smithsonian Environmental Research Center in Edgewater, Md. "We don't know very much about the sources of methylmercury to coastal waters. It is a hot topic." She says that the study's findings, however, are consistent with "a growing consensus that coastal fishes are acquiring mercury from methylmercury produced in the coastal zone." On a global average, the amount of mercury falling out of the sky has tripled since the Industrial Revolution 200 years ago, due primarily to the burning of fossil fuels. "As a result, most mercury today enters most landscapes through atmospheric deposition," Gilmour said. This mercury is converted into the methylmercury by sulfur- and iron-reducing bacteria, which reside in wet, low-oxygen soils and sediments. "People have assumed that methylmercury must come from the bottom of the ocean or from surface waters flowing to the coast, but never from groundwater," said UCSC biogeochemist Adina Paytan, also a coauthor. The scientists did not attempt to identify the sources of mercury in groundwater. But Frank Black, a former doctoral student at UC Santa Cruz, now a postdoctoral researcher in biogeochemistry at Princeton University and the study's lead author, believes that some of the inorganic mercury is likely coming from natural processes such as weathering of local mercury-containing rocks. Mining and other human activities are also likely sources of mercury in soils and sediments. In terms of understanding where inorganic mercury is converted into methylmercury, Black believes that septic tanks in the vicinity of Stinson Beach, because they provide nutrients to methylating bacteria, may be contributing to methylmercury formation. At Elkhorn Slough, the leading theory is that groundwater is flushing out methylmercury from sediments where it is being produced. In addition to Black, Paytan and Flegal, the coauthors of the paper include Karen Knee and Nicholas de Sieyes of Stanford University and Priya Ganguli and Ellen Gray of UC Santa Cruz. Note to reporters: You may contact Flegal at (831) 459-2093 or flegal@etox.ucsc.edu.